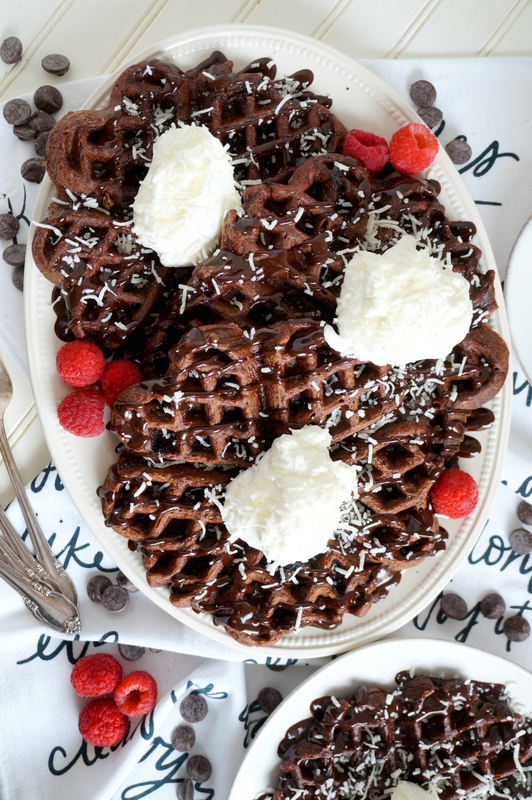 These rich Vegan Chocolate Coconut Waffles are packed with chocolate chips and coconut milk, coconut oil, and coconut flakes for a delicious tropical twist! Hey hey!! 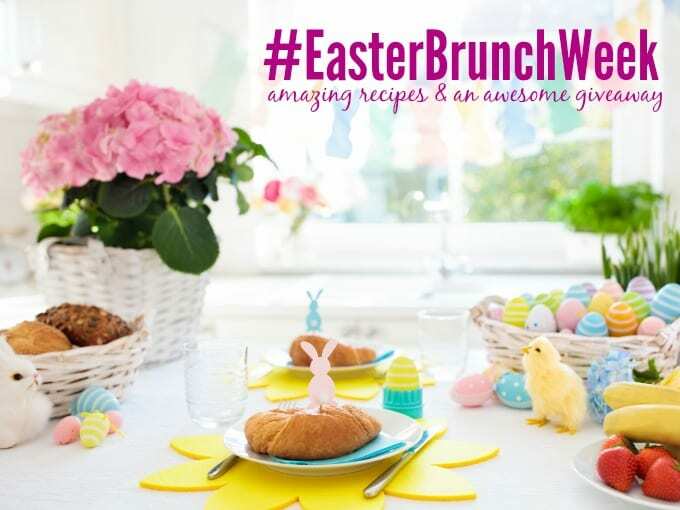 Can you guys believe today is the last day of #EasterBrunchWeek? 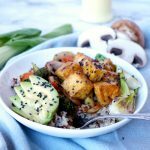 At least for me… the GIVEAWAY continues for a few more days, so be sure to enter if you haven’t already! 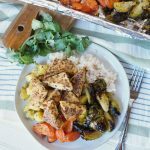 Get all the deets at the bottom of this post if you’ve been out of the loop👇🏼 And now, time for the last recipe! 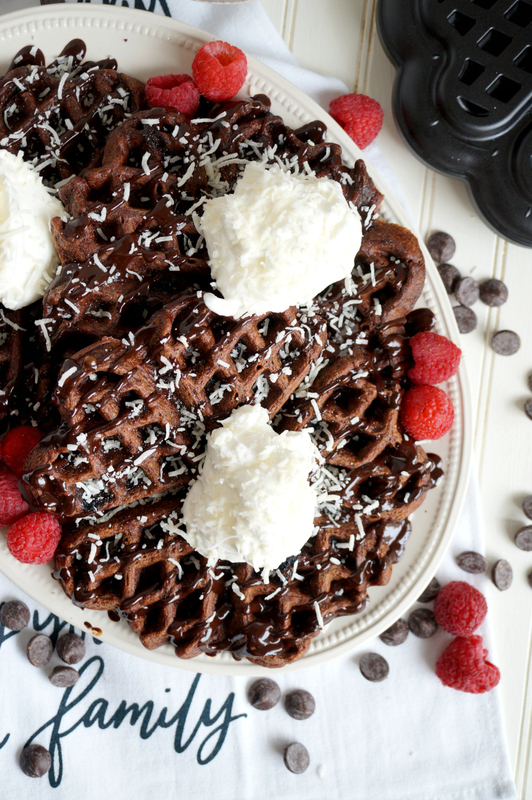 These Vegan Chocolate Coconut Waffles are made with cocoa powder, coconut milk, shredded coconut, and coconut extract for the most coconutty goodness I could pack in one bite. 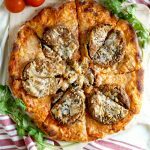 Oh, and topped with coconut whip, too! 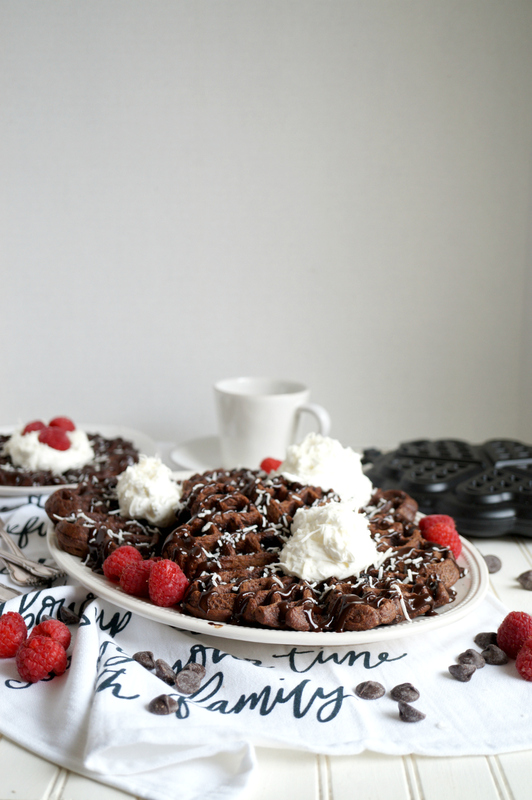 They’re so cute because they’re cooked in the most adorable Sweetheart Waffler by NordicWare. Let’s go make them! 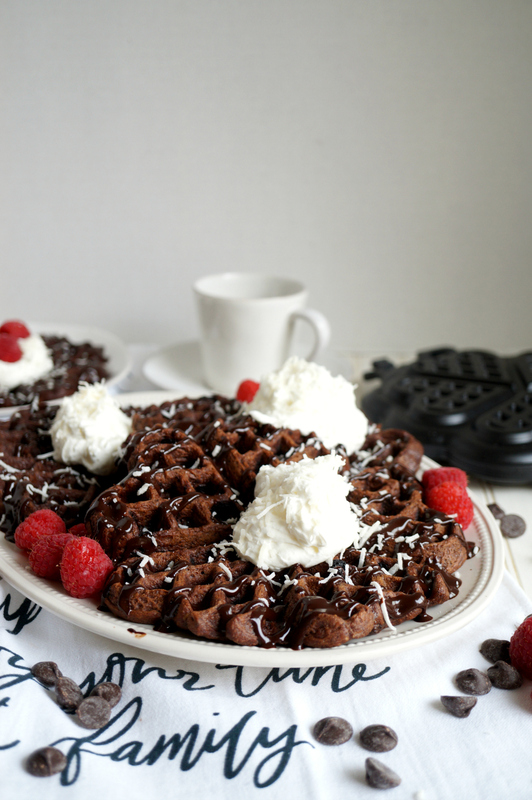 If you’ve always wanted a waffle maker but thought those electrical ones were too bulky and took up too much space, NordicWare created the perfect solution. This cute lil waffler is used on the stovetop! So when you’re not using it, it takes up about as much space as a little frypan. It’s great for those of us with little apartment kitchens! 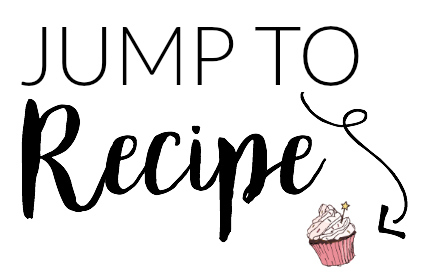 In case you haven’t been keeping up with this week’s treats, here is a recap for you! First, place your can of coconut CREAM in the fridge overnight to solidify so that it can be whipped the next day. Be careful not to shake the can at any point! When ready to make waffles, combine the flaxseed and water in a small bowl and set aside while you prepare the rest. 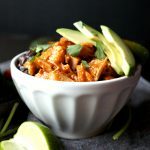 In a large bowl, whisk together the flour, cornstarch, cocoa, sugar, and shredded coconut. Add in the coconut milk, melted coconut oil, coconut & vanilla extracts, and the prepared flaxseed mixture. Finally, stir in the chocolate chips. 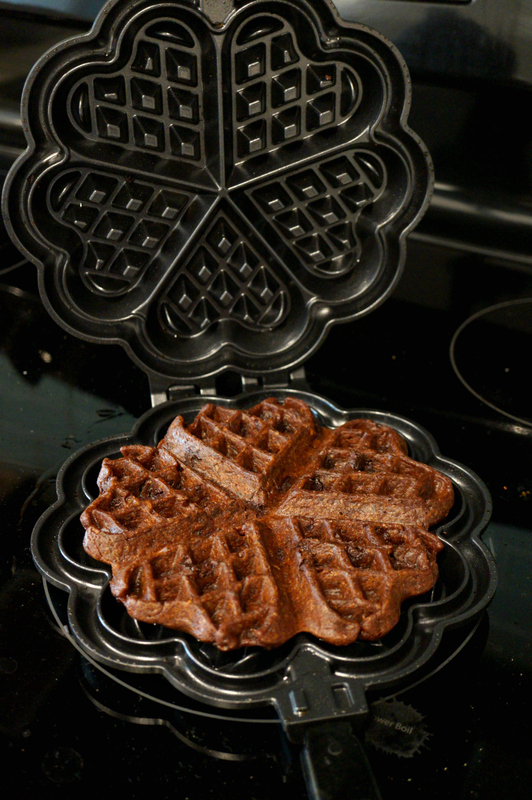 Heat your NordicWare waffler over medium heat for about 5 minutes. 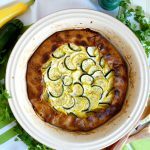 When ready to cook, spray both sides with nonstick spray. Pour in about ¼ of the mixture into the waffler, and cook for about 5 minutes, then flip and cook for 5 minutes more. Be sure to watch the heat and lower if needed, as the iron stays really hot! When waffle is cooked, transfer to a wire rack to prevent from getting soggy. Repeat with all. To serve, open your can of coconut cream and carefully spoon out all the solid pieces from the top of the can. Place in a medium bowl, and whip as you would regular whipped cream. Add a spoonful of powdered sugar if desired. 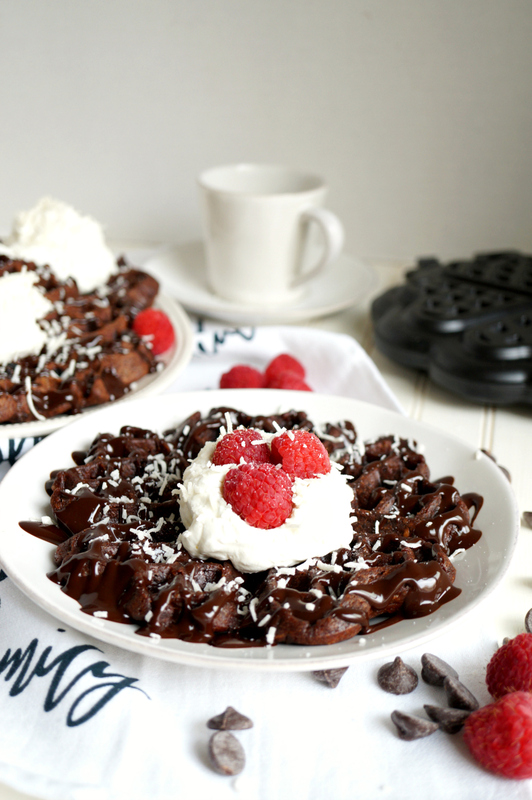 Top the waffles with melted chocolate, the coconut whipped cream, and some shredded coconut and fresh raspberries. Enjoy! These waffles look so incredible! 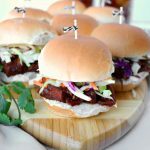 I can’t believe they’re vegan! This are a beautiful plate of waffles. 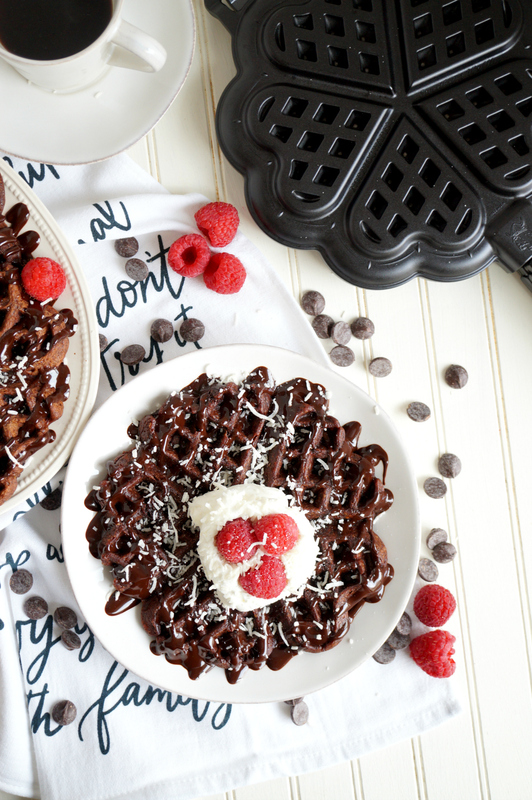 My youngest loves chocolate, and I would love to make him a plate of theses waffles!